BIG RAPIDS — Voca Lyrica, Big Rapids’ women’s singing group, was again invited to participate in a performance of the music of Gwyneth Walker featuring a brand new commission to be premiered on the DCINY Concert Series in New York City. 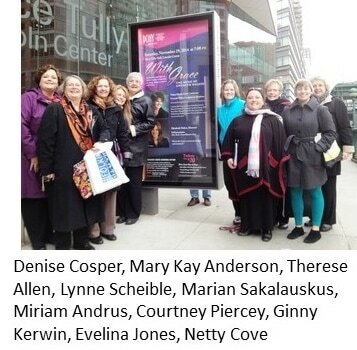 This performance will be Thanksgiving weekend at Lincoln Center’s Alice Tully Hall, under the baton of Nancy Menk. Maestra Menk is chair of the Department of Music at Saint Mary’s College, Notre Dame, and serves regularly as a guest conductor choral adjudicator throughout the U.S.
Gwyneth Walker has been composing music all her life. Most of the concert repertoire comes from Songs for Women’s Voices which are musical settings of poems by American poet May Swanson. Members of Voca Lyrica will join an elite group of about 200 singers of women’s ensembles from around the nation. They will spend four to five days in New York to participate in musical clinics in preparation for the concert, enjoy some of the sights of New York City, share Thanksgiving dinner together and all culminating with the piece de resistance of being able to perform at Lincoln Center.